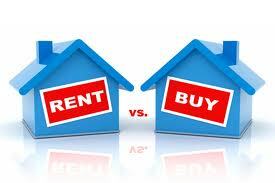 Wondering whether to buy or rent? Wondering if buying a home makes sense? Per a recent CNN Money article, the answer is YES! Especially in the Atlanta Market! CNN Money predicts a breakeven time of only 5.9 years when comparing a median home price of $176,200 to a median rental rate of $1950/mo. Did you know that renting represents a lost opportunity for financial gain as well? Building equity, appreciation and tax deductions are all monetary benefits of home ownership. Better to do this for yourself than someone else (your landlord). For example, renting a home for $1,000/mo over a 5 year period represents $60,000 in lost mortgage payments, which includes principal. Using the CNN example with rent at $1950/mo represents $138,060 in lost mortgage payments over a 5 year period. That’s pretty significant when it comes to long term financial planning. Thinking about moving up? Today’s market presents the perfect scenario, especially compared to last year (red vs. blue below). Inventory in the <$500,000 price range has reached a seller’s market through Q2 2012. 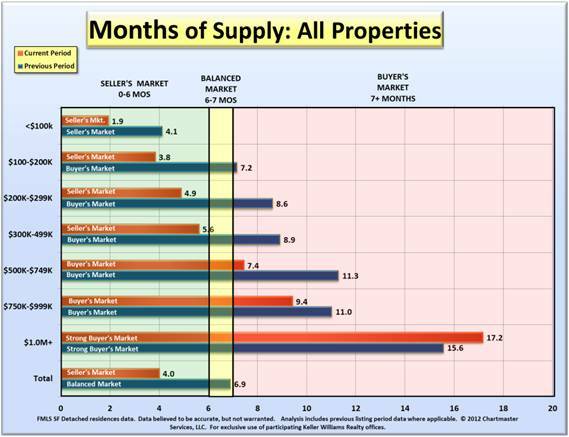 Conversely, the month’s supply of inventory in the move up price ranges, above $500,000, represents a buyer’s market. You get the best of both worlds! How perfect is that? A rare break like this won’t last long! Don’t miss out, call me TODAY to seize your opportunity!